What is Hapkido? 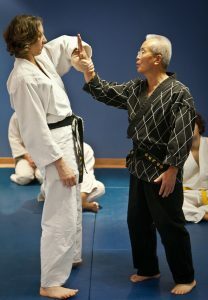 Learn about Hapkido and Ki Meditation training. Hap: the coordination of mind & body. Ki: the inner energy that is created and manifested through “Hap”. Do: the self-controlled and disciplined life necessary to create “Hap” and “Ki”. 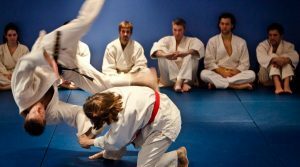 Unlike most martial arts, Hapkido is a complete system teaching kicks, punches, pressure point techniques, throws, joint locks, weapons, free fighting, ki and meditation. Many other martial arts are “hard” – they rely on physical power and are offense oriented. Hapkido is “soft” and defensive, emphasizing throws, twists and pressure point techniques. Hapkido minimizes injuries with techniques that completely subdue the opponent. 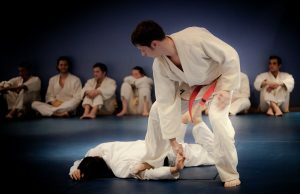 In order to defend against attacks, Hapkido teaches corresponding offensive techniques. For instance, before teaching defence against kicks and punches, kicks and punches are taught. Before learning defences against weapons, students must learn how to use those weapons. Chang’s Hapkido Academy’s complete approach stresses the importance of mind and body. 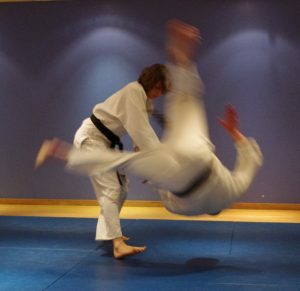 Mastering Hapkido, or simply learning to fall properly or perform a new kick, is not only about body awareness and physical technique – the first and most important step is to liberate your mind. The three Hapkido principles aim to describe the philosophical ideas that define Hapkido. These fundamental concepts have relevance on both a physical and spiritual level. The history of Korean martial arts began about 16 centuries ago at approximately 372 A.D. At this time it was mainly the Buddhist Monks who began developing what fighting arts there were in Korea. Nobleman and people from the elite classes would secretly practise these fighting skills, taking care to keep their skills from the lower classes. 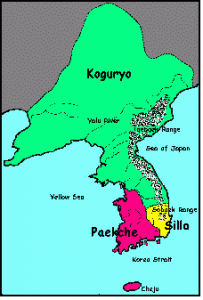 During this time, Korea was divided into three warring kingdoms: Paekche, Koguryo and Silla. Koguryu was the largest of the kingdoms and most often the aggressor. Silla, however, possessed the most advanced culture and it’s sophistication helped the small kingdom ward of it’s enemies. In the 5th century, the kingdom of Koguryo invaded both Paekche and Silla. After holding off the invaders, Silla became even more united with new efforts to improve itself. One of the most important improvements was the creation of an elite fighting group called Hwarangdo. This group comprised of specially selected noblemen who excelled intellectually as well as physically. They were taught the arts of philosophy, science, verse, as well as Ki and martial arts skills. The Hwarangdo helped Silla defeat her enemies and unite all of Korea. 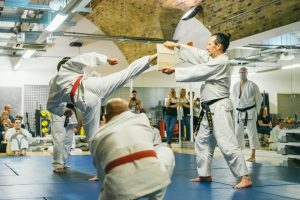 As the years passed, some masters began to specialise in specific areas such as kicks or throws; they developed individual schools that would later be known as Tae Kwon Do, Korean Kendo and Yew Sool, etc. Many monks and some martial art masters however, continued to teach, improve and modernize all the fighting techniques, practising a “complete” system under the name of hoshinsul (self-defense technques). In 1904 Japan invaded Korea. After conquering the country the Japanese required the monks to take wives and banned all martial arts. Masters of the martial arts were forced to hide in the remote monasteries and mountains in order to be able to preserve and pass on knowledge to their disciples. The martial art ban lasted 36 years until 1945. One master who withdrew to the moutains was Choi, Young Sool. During his 36 years in the mountains he helped to develop and modernize what we now call “Hapkido”. Another well-known name within Hapkido history is one of Choi’s disciples Ji, Han Jae. 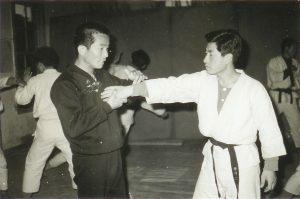 Master Ji was instrumental in reviving Hapkido in post-war Korea. He developed more kicks and techniques and helped Hapkido to flourish through the creation of a governmental organisation known as the Korean Hapkido Association. Early photo of Grandmaster Chang teaching Hapkido. Master Gedo Chang was a contemporary of Master Ji who learned Hapkido from his father, a Buddhist monk. In his twenties Master Chang left the mountains of Chungnam province and the monastery he had grown up in. Arriving in the city he became formally recognised as a master (1964) by the newly created Korean Hapkido Association. He then opened his school in Korea and called it Wol Ge Kwan which means “The Victor’s Laurel”. He was the first to develop Hapkido techniques specifically for police personnel. His teaching abilities so impressed the Korean Government, that they created a special award for “Best Martial Arts Instructor”, and presented it to Master Chang. In 1973, Master Chang moved to the United States of America and settled in Lombard, Illinois where he opened his first U.S. School, “Chang’s Hapkido Academy”. Since then he has demonstrated and taught throughout the USA and is currently President of the World Hapkido Union. Chang’s Hapkido Academy opened it’s first UK school in 1993 under Master Tammy Parlour. Ki Meditation is a unique blend of breathing exercises, stretching, and meditation to help you relax, become more flexible, and to harness your inner energy. Martial artists traditionally practiced meditation techniques as part of their daily training, to overcoming the fears and anxieties they might experience in battle. Though we may never be confronted by a physical attack, the majority of us are regularly struck down by fear, stress and anxiety. Meditation can help to counteract the stress response. It does this by slowing heart rate, improving oxygen consumption, rebalancing hormones, settling the mind and boosting energy levels. Simply sitting quietly by yourself and bringing your attention to your breath is a great way to start reaping the benefits of meditation. Meditation is not just a simple relaxation technique as some magazines seem to espouse. One might feel relaxed after meditating, but it is much more about wakefulness. This means moving beyond simply turning the volume down on our lives and really waking up to our full and unlimited potential. At a fundamental level, meditation is about understanding ourselves, our relationship to others and to the world outside. A meditation class provides access to meditation techniques as well as helping to provide the support and discipline to make this a healthy habit. Our ki meditation class take offers protected time and space for you to develop your meditation practice.